showcasing for the finer work of David A. Martin. My favorite way to create jewelry is from the ground up. Finding or buying rough stone material, cutting and polishing my own stones, fabricating the silver shanks and bezels from scratch. This allows me a wide range of creative freedom, there are no standard molds, sizes or components here. So this store is a place where people can see the manifestations of my imagination, they can see what i saw when i looked at the materials, they can hear the story or song that the stones sang to me somewhere deep inside. I find that these things i make, especially the rings are like little treasures to me. The finished product is a little ornate treasure, something with enough strength and integrity of design to withstand quite a journey through time. Sometimes i think of them as time capsules, they hold so much of my mind and imagination in them, they are like songs made of silver and stone, sung in a very private language which would be hard for me to translate to another being. I have tried and i think it helps shed light on me and my mind and my personal mythos, but my hopes are that others see my jewelry and hear their own amazing songs and stories, that these pieces speak to others in ways impossible for me to quite fully understand. About five years ago, i was going through another one those phases in my life where i just had to work for myself. I needed to be in control of my schedule, my day. I wanted to make my living on my own, without a "job" per se to go to. I knew that what i wanted to do was to be physically active and to get the arts and creativity back into my life. I was doing a lot of handy-man work then, landscaping, remodeling, grounds keeping and grounds development. This gave me the physicality i needed, as well as quite a bit of creativity when it came to caring for plants and trees. I even built a greenhouse for a client and was able to do some work in it when it was complete. 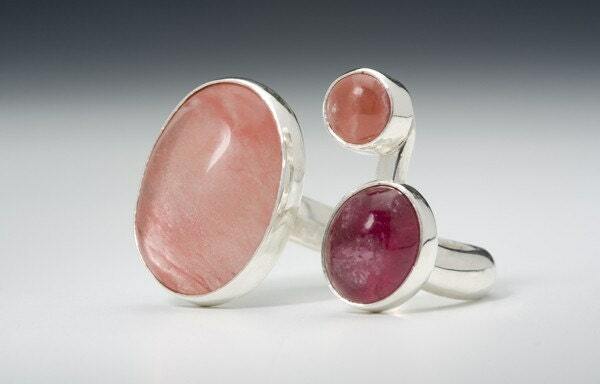 One of the people i did work for was Michael Boyd, a very accomplished artist and jeweler. One day in talking with Michael i mentioned my intention to get the arts back into my life. He suggested that i come into his studio one day a week to help him out and he could show me some lapidary and metal smithing techniques. I started working with Michael one day a week, trading his knowledge for my help keeping his studio clean. When he saw that my attention to detail and quality of work translated effortlessly in the jewelry field he offered to employ me for several days a week helping fabricate his jewelry. At first this was mostly cutting and polishing stones, making bezels and cleaning up and polishing the silver work after he was done soldering the various stages of his pieces. Soon i was working with him full time helping him create these amazing pieces. About a year ago, my desire for autonomy and creative control led me to make up my mind to begin doing my own design and fabrication. I purchased some basic equipment, even finding two used lapidary arbors for a price i couldn't refuse, and set up my studio in an old free standing garage. It's in a state of constant improvement, i installed a small 1950's wood-burning Army stove just in time to stave off the cold Colorado winter that was infiltrating the old garage. Broadly, i'd have to categorize it as exploring and discovering, or experiencing and learning . . . specifically it would be hiking or being out in nature, being creative. I was raised by a father who enjoyed the outdoors and took us hiking and backpacking often. It's where i learned to love stones and the wonders of the natural world. The next things on my list would have to be reading and writing. Finding the time to do the work in long sustained and focused periods of time. Currently i have another job to help make ends meet. That and having a family are the two things i invest a lot of time in, so i'd have to say scheduling or creating time to work in an efficient manner would be my biggest challenge. Companion Ring 1 or The Path Illuminated. I mean, these rings don't exactly fit my finger, but these two rings are very special to me because they are both "firsts" in new directions in design and style for me. Particularly these two rings are very recognizable markers for me because they are primary manifestations of my initial work within a certain frame of mind or associative concept between the material world and my imagination. Any other favorites you'd like to feature? I like to feature new work, because it's something fresh for those returning to my shop. It's also my current creations, you know, my new babies. Right now i am featuring a Poppy and Citron Blossom Ring. When in Taos, New Mexico there are a few things i always do. I get a nice Porter at Eskes Brew Pub, i eat breakfast at the Dragonfly Cafe, treat myself to a book at Moby Dickens and i always visit the same wonderful fabric store, Common Threads. This time while at Common Threads, i found some wonderful raku fired buttons made by a local potter and artist, Kerrie Lynn-Cohn. She uses her own glazes, and in this case they are Poppy and Citron. I fell in love with these small pieces immediately and came up with some ideas of how to use them as jewelry right there in the fabric store! After crafting the ring shank and the stamen cluster, I connected them through the existing button holes of the stacked buttons. I have a few more of these buttons and plan on making a slightly smaller version soon. An astronaut . . . at least when i was very young that's what i wanted to be, but for the larger part of my life i thought i would be an artist, especially a writer. Something between a comic book artist and an expatriate bohemian novelist. In that regard i've been quite successful since i would consider myself both an artist an a writer.
. . . I've a ways to go with the astronaut thing, though. Marta Sanchez' shop is one i check often to see what she's doing now. I just can't get her work with Chrysocola in her Nut seriese out of my mind. The ring keeps coming up in my mind. She's one of those artists with such a huge breadth of work and such a creative scope of vision and interpretation that there is always something there for my mind to chew on for awhile. Jessica Doyle's shop full of amazingly imaginative and skillfully rendered miniature life of fungi, sea life and other biological wonders such as The Wise Barnacle caught my eye. So many of her works that i marked as my favorites to go back to later are now sold. Also i love some of the imagery at the f2images shop. I am working on designing a website for myself and wondering about the possibility of somehow using some of the imagery there in digital format (html code or some such) for background aesthetics, i am referring to pieces such as the "8x8 Magnolia" listing or the "5x5 Fading" listing. I have been exclusively designing and fabricating my own jewelry in my own studio for a year now. It's been a good year, a very creative time. So i see myself making more unique one of a kind pieces. I'm also working on a few designs which will require less intricate fabrication and cut back on my time. I'm looking to add a line of designs that are less expensive and in a fashion, more replicable to reach a broader customer base. My hope in doing this is to create more abundance and a wider arena for greater expression and connectivity in the art world which i hope translates into making a higher percentage of my living through artistic creativity. I also have a show in 2010 at the Sangre De Christo Arts and Conference Center in Pueblo, Colorado with local artists Randy Wix and Justin Reddick. They are multi-media modern abstract painters who have asked me to compliment their work with some of my own. I'm actually not thinking of using jewelry as my medium for that show, but have been working with some designs for wall pieces, but still integrating metal and stone. The working theme of the show, currently, is The Industrial Revolution, so it should be fun. I'd like to work in some fossils and found metal, silver and ciefenite. I have a patchwork quilt of a novel i'd like to tighten up and get a decent first draft of too this year. Visit Dave at Etsy or davidamartinjewelry.blogspot.com for more from this fabulous craftsman!